Olessya a forward-thinking fashion insider with a rich experience in image consulting and celebrity styling, and clients worldwide. She has launched several pro-fashion projects, including O’CHIC Studio and INDEED Magazine. Olessya Assimova grew up in Kazakhstan, a Soviet country, where clothing items were made for functionality rather than style. Her view of fashion was shaped by these practical, quality goods, leading her to desire a balance between beauty and durability in fashion. Over a decade in the fashion industry – that is Olessya Assimova’s professional background before creating “THE ART OF WARDROBE.” She’s proven herself as a masterful stylist, image consultant and personal shopper who sees styling as an exciting way to make one’s life easier, brighter and happier. After working with clients and various media in different parts of the world, she settled down in Barcelona, Spain, where she was so inspired, she launched two ambitious projects: O’CHIC Studio, a place where one can transform his style from head to toes, and StyleYourLife.today, an online zone that focuses on wardrobe evaluation. From her vast insider knowledge, she understands what challenges usually stand between people and their clothes. Olessya decided to sum up her knowledge and suggest her own effective solutions to a broader audience. For the first time, she has stepped on the writing path to throw some light on the secrets of sustainable shopping and on forming a modern wardrobe for joyful living. As a result, “THE ART OF WARDROBE” is a complete professional instruction guide to building personal style. Success! The Art of Wardrobe sold 39 pre-orders by Dec. 5, 2018, was pitched to 7 publishers, and will be self published. Get your copy before it becomes a bestseller with a 40% discount. Regular price is $25. Get your Paperback copy now with a 30% discount. Regular price is $35. $35 Get your Signed copy! 100 Early Bird "Signed" copies (your name or the name of your friend acknowledged in the book). 2 Copies (one for you and one for a friend). 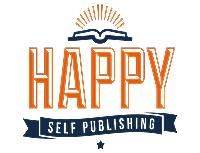 Regular price for two book is $70, a good deal! A new step-by-step guide on personal style that will transform the way you perceive clothes. Sample chapter of the book is available here. THE ART OF WARDROBE is the answer to the problem of having closets full of clothes, but nothing to wear. In this helpful guide, Olessya Assimova offers practical solutions for developing your own unique style, plus a wardrobe evaluation for organizing your clothes for maximum functionality. Going a step beyond most fashion books that simply promote style and beauty, this book also offers a step-by-step plan for looking your best without breaking the bank or cluttering your closets. Olessya focuses on how to choose essential items that show off your unique style, flatter your figure, and promote sustainability. Olessya brings her extensive experience as a personal stylist and image consultant to this helpful guide for women of all ages and every background. Find tips on how to clear closets of clothes that no longer suit you, use practical and environmentally-friendly suggestions for passing on unwanted items, and take the mystery out of shopping for the right clothes for your style, coloring, and body shape. Stop cluttering your closets with impulse buys that don’t fit in with the rest of your clothes and leave you with many articles of clothing, yet still “nothing to wear,” and embrace the durability and timelessness of a well-crafted wardrobe. Olessya will guide you seamlessly through every step of building and organizing a stellar ensemble that you will love to browse every morning as you get dressed. As you learn how to lay the foundation for an organized, purposeful, and beautiful wardrobe, you will gain freedom and power over your fashion choices and purchases. Use this handy guide as a reference as needed, keeping it on-hand for when it’s time to add to your wardrobe, or time to get control of your crowded closet. But you may also use Olessya’s practical tips for shopping and beyond. Training ourselves to question what we need versus what we want, letting go of things that no longer serve us, and surrounding ourselves with things that bring us joy is not just a shopping skill, it’s a life skill. I begin with the practical matter of assessing and organizing your closet. I walk readers through the process of developing “wardrobe capsules” for organizing and developing a functional wardrobe that suits every activity, season, and occupation. I help readers sort through their current clothing to free their wardrobe of unnecessary items, using clearly outlined criteria, and offering environmentally-friendly solutions for giving unwanted items new life. I offer practical steps for storing and preserving clothes. I discuss the elements of developing your own personal style. I take a look at four personal characteristics that contribute to image-making. I show readers how to asses their skin “temperatures” to find the best color palette. I demonstrate how readers can use horizontal balance to determine their body shape. I discuss a practical approach to shopping. I consider the pros and cons of online shopping versus shopping in brick-and-mortar stores. I discuss how to develop a shopping list, a budget, and a plan for a successful and stress-free outing. I offer practical tips for enjoying the shopping trip to its fullest. I offer background on my work as a personal stylist and image consultant, and my desire to help women develop their own personal style and optimize their wardrobes. I offer a deeper look into three elements of developing readers’ own personal style. Which colors are best for your skin tone? I offer tips and tests for determining skin tone, and finding the most flattering colors for each. I offer visuals to help readers determine their body shape. The target reader for THE ART OF WARDROBE is a woman of any age and is primarily English-speaking. This international readership loves fashion and is open to experimenting as they look for their own style. This practical guide will help them successfully set up their wardrobe, planning clothing shopping, choosing clothes that flatter their figure and creating outfits for any occasion that life may send their way. THE ART OF WARDROBE promotion has already started. It is based on building a community of like-minded people, who are interested in style and fashion. I’m new at writing, yet have worked in the fashion industry for more than 10 years. I’ve packed wardrobes in Paris, Dubai, and Barcelona, worked for prestigious fashion media, was a personal image consultant for dozens of women, launched my own image studio and even an e-magazine. Thanks to it I now have a rarely rich experience, a vast clients’ base and an access to many useful information sources. I love public events and I’ve already started a workshop series to warm up an interest in the book. When it will be published, I’ll set off for a publicity tour with my “THE ART OF WARDROBE” workshops. Also, soon I am going to become a curator for a young student’s group who wish to make their future in the fashion industry. The main marketing advantage we are going to develop is an online support service for our readers based on Facebook and Instagram. 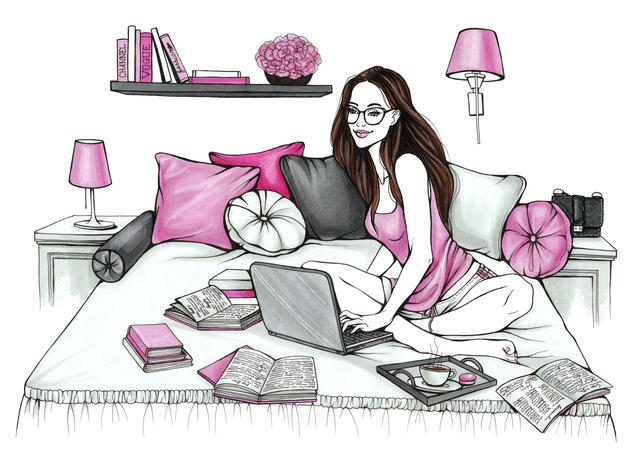 This service will provide them with a free chance to communicate with an author and get personal styling advice. It’s a unique offer that NO other book on style has ever made. Besides, the book has profiles on social media to use as a promotion platform, including Facebook, Twitter, Instagram. YouTube is not the exception: I’m starting my own YouTube channel with a special video course based on the book. We collaborate with bloggers and influencers with the same target audience to spread the ideas worldwide and expand our reach. 2. THE ART OF WARDROBE emphasizes the sustainable approach to shopping and fashion. 3. THE ART OF WARDROBE is created according to modern trends. It illuminates topics of current interest and gives tips and advice useful for today. 4. THE ART OF WARDROBE has an original design and illustrations created by a professional artist. 5. Last but not least, THE ART OF WARDROBE offers its readers a unique opportunity to be in touch with a professional stylist and get help on every topic they face while reading. Published by: Penguin Group (USA) Inc. Description: A celebrity fashion stylist reveals the tricks of her trade and shows women of all sizes how to pull together their own polished, individual look. Differences: “THE ART OF WARDROBE” was written 13 years after “The Pocket Stylist…,” so it’s much more timely as a shopping and wardrobe guide today. “THE ART OF WARDROBE” includes similar sections on figure types and dressing them, but it broadens personal recommendations with face types and ways to complement them, offers practical tips on choosing a personal color palette, offers a detailed scheme of cleaning up the wardrobe and organizing it, and focuses on sustainable shopping. Description: With so many style and shopping options, it can be difficult to create a streamlined closet of pieces that can be worn easily and confidently. In The Curated Closet, style writer Anuschka Rees presents a fascinatingly strategic approach to identifying, refining, and expressing personal style and building the ideal wardrobe to match it, with style and shopping strategies that women can use every day. Including useful infographics, charts, and activities, as well as beautiful fashion photography, The Curated Closet is the ultimate practical guide to authentic and unique style. Differences: Anuschka Rees is a writer, as she says herself, while Olessya Assimova is a professional stylist who gives her recommendations based on her vast experience of working with different people. “THE ART OF WARDROBE” is illustrated with drawings, not photographs. “THE ART OF WARDROBE” has a strong successive structure of chapters that lead a reader through the steps of building her own personal style: from discovering personal features through cleaning out a current wardrobe to shopping and pulling out completed outfits for a living. Description: This guide explains the what’s, why’s, and how’s of styling; so whether you’re looking to update your wardrobe or curate your closet, this book has the answer. Accomplished stylist Somer Flaherty helps readers figure out what their look is (or ought to be), and how to tailor that look to their own particular body type. Also, for all of the future Rachel Zoe’s out there, Flaherty helps readers understand the skills that are necessary to style others, and to even turn styling into a real career. Differences: The main difference is that “THE ART OF WARDROBE” has sections like “Wardrobe organizing” and “Shopping” that give practical advice and detailed instructions on the topics. “The Book of Styling” says nothing about these areas, and fails to address the idea of sustainable consumption and sustainable fashion. Description: From Nina Garcia—fashion judge on Bravo’s hit Project Runway and author of Style Strategy and The One Hundred—comes her wildly popular New York Times bestseller The Little Black Book of Style. Here, in one indispensable volume, are Nina’s ultimate rules of style to help you uncover your own signature look. Differences: “The Little Black Book of Style” content is based more on the author’s thoughts, insights and experience on the phenomena of style, while “THE ART OF WARDROBE” is more about practice and is structured according to the practical use of information for the reader. “THE ART OF WARDROBE” gives a lot of tips for choosing the best look for your figure and face type. “The Little Black book of Style” also has no information about sustainable fashion. Description: From Nina Garcia—fashion judge on Bravo’s hit Project Runway and the New York Times bestselling author of Style Strategy—comes The One Hundred, the companion edition to her wildly popular The Little Black Book of Style. A must-own list of all the items every fashion-conscious woman should have as a solid, stylish foundation, The One Hundred features gorgeous illustrations by Ruben Toledo. Differences: “The One Hundred” represents a list of items essential for every wardrobe, mixed with facts and advice on wearing each item. “THE ART OF WARDROBE” is a complex successive guide to building personal style, from detailed analysis of appearance to wardrobe transformation, from planning a shopping day to creating outfits for every situation and occasion. In my childhood, there were only a small amount of clothes accessible. The goods in stores only fulfilled basic necessities. One sunny winter morning, I had just opened my eyes when my mother came home and told me she had a surprise for me. She put her hands in a bag and pulled out an amazing pair of sky-blue winter boots, with fluffy fur inside and tiny star pattern outside. “Look, how beautiful they are! Made in the Czechoslovakia. Enjoy!” she said. It was like a dream! This pair was the loveliest that I had ever seen in my 6-year life. To buy those, my mom visited a local market at 5 a.m., armed with a flashlight. She couldn’t believe that she’d come across such pretty clothing in our Soviet country. It was true luck to find something like this. The majority of the clothes in the local market were very basic, uninteresting, and lacking in design. The one characteristic that these items possessed was quality. My younger cousin waited for years for me to outgrow my clothes so that she could get her turn with those pieces. Handing clothes down wasn’t considered shameful, because the garments seemed to never get worn out. They could be worn for years. The question of whether to leave a piece for the next season or not simply didn’t exist among common people. I still wonder who produced all of those goods, and how they made them so extremely durable—it was like a miracle. In hindsight, regardless of the deficiencies, that time was romantic in its own way. People enjoyed simple pleasures and were happy whenever they were lucky enough to get something attractive and brand new. Just like my mother, who always tried to provide me with the best she could get, shelving her desires to make sure that I was happy and had all that I needed. Today, the general picture differs greatly from what I depicted above. We have access to an infinite number of garments, designs, and colors. Modern clothes serve not only as protection from environmental conditions, but as tools for making us happy, self-confident, and satisfied with what we see in the mirror. Paradoxically, the more clothes we have, the less pleasure we tend to get from them. Can you honestly say that your closet, stuffed with a rich variety of pieces, warms your heart and makes your life easier? I believe not many of you can answer “yes” to that question. There’s something wrong with that situation. This is not how it was supposed to be. What is the reason? How is it that despite having all of these clothes at our disposal, we still don’t have garments that we really want to wear from week to week, from year to year? Or if we do have such things, how do we only have a few of them? I imagine this is the reason you are reading this book—the feeling that something is wrong and the desire to do something about it. The situation of overspending, crowded closet space, and lost energy should be fixed. To solve this we must analyze the problem, sort is all out (literally and figuratively), and take action. Are you ready? The fact is, the modern fashion industry is focused on making money, not match-making a perfect, long-lasting union between you and your clothes. The more you buy, the better. Competition in the global fashion market is fierce. To stay on top, brands use strategies like eye-catching advertisements, created in cooperation with sociologists and psychologists, merchandising tricks, special offers, weekly changing collections, and trends switching. How can we resist shopping temptation within such a system? For me, the most disappointing aspect of modern fashion is the shockingly low quality of most goods. It is understandable from the fashion market perspective: why produce high-quality pieces that you’ll wear for years if they can make one-season clothes and you’ll be excited to buy new outfits again and again? The system works well. It earns the companies huge profits. But do you like to feel fooled? Me neither. No one does. That is why people are increasingly turning to so-called “slow” or sustainable fashion. The opposite of fast fashion, this concept follows principles such as individuality, uniqueness, high quality, and environmental friendliness. I’m happy to see new designers basing their creative work on eco-aesthetics, companies building their businesses according to ideas of sustainable manufacturing, and common consumers who are starting to choose quality over quantity. This growing community shares wonderful ideas. Its members value a personalized approach to style and clothing, and they seek a sincere relationship between us and the pieces we wear. They are working to create a world where your clothes match your personality and highlight your uniqueness, rather than pulling you into an endless trend race and obligation to be “in.” Wouldn’t it be wonderful to feel free from a duty to fit in? To be able to wear your favorite pieces for years? 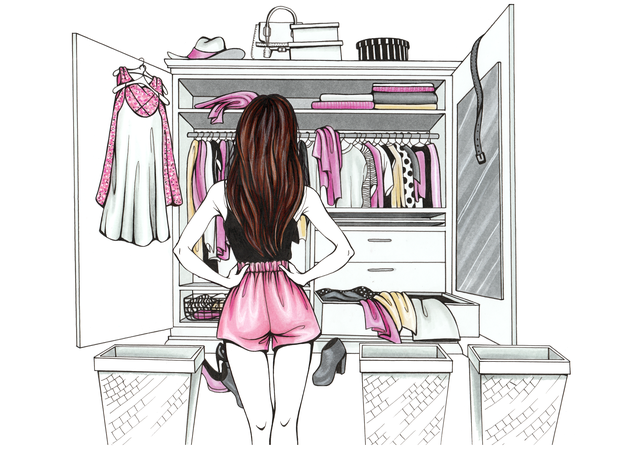 To open your closet in the morning and think “I love you” about your clothes? The clothes that didn’t appear in your wardrobe by chance, or that weren’t bought simply because of the cool ad campaign, those are great. The clothes that you have warm feelings for, also great. The clothes with character, history, and special energy, the same. Enough of experiencing shame, confusion, and anger in front of your wardrobe. I vote for real love towards each piece of clothing that you possess, and living happily ever after with it. My goal is pretty simple: to become your personal GPS in the fashion jungle. I want you to feel free and to become absolutely confident in how you look and what you wear, as I once managed to achieve. I want you to feel what the right clothes are capable of. I want you to feel that the things you put on give you massive, mighty, white (or black, as you prefer) wings to experience the real power. The more we know about ourselves, our preferences, personal style, and fashion in general, and the better we apply this information, the fewer pieces we need in our wardrobe. This knowledge raises self-confidence to a new level and helps us understand our actual needs. After realizing what we require for a happy lifestyle, and what we just blindly want, it’s time to accept one simple fact: what we see in our wardrobe today is a result of our own actions, attempts, and mistakes. 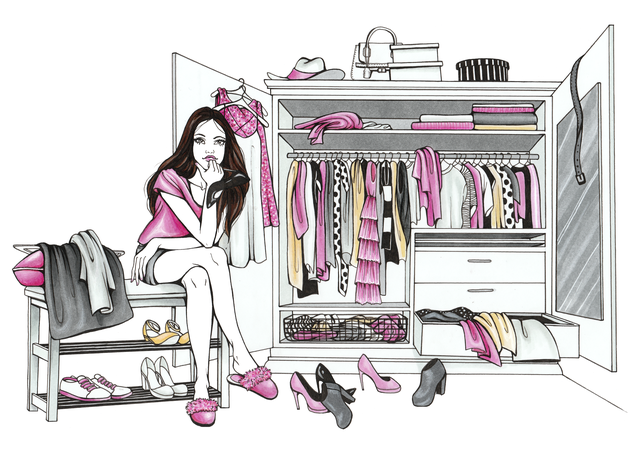 No one is responsible for the mess and “nothing to wear” dilemma but us. But we have the ability to fix the situation, find a unique style, and create a functional wardrobe. Now it’s time to create the foundation of personal style: the high-quality, multi-functioning wardrobe in harmony with your appearance, personality, and lifestyle. Most of us are waiting for some kind of a magic formula or an innovative pill to solve our problems in an instant. It’s like our brain is designed to hold on to this hope. But of course solutions never come without making some effort. This is also true when it comes to style. We hope that this stylist, or that designer or influencer will take one look at us and offer us a personal style that will suit our appearance, lifestyle, and inner world perfectly. But because we are each unique, there can never be one universal styling scheme. You can’t take a template and make it suitable for every single person on the planet. In personal style, the idea of stamping is the opposite of individuality. This is why it is so important to navigate your own way to “wardrobe happiness” yourself, searching for the best solutions, listening to your heart, and applying these ideas to your lifestyle. A professional stylist can assist you with his vast experience, but cannot dictate what to choose. No one knows you better than yourself. Don’t be afraid of the work, time, and energy it will take to create your own formula for success. The reward of having a wardrobe you love will be worth it. I hope this book inspires and guides you in the exciting adventure of personal style. Together, we will lay the foundation for creating an efficient, comfortable, and multi-functional wardrobe. on Nov. 5, 2018, 10:29 p.m.
on Nov. 6, 2018, 3:52 p.m.
on Nov. 8, 2018, 3:11 p.m. So happy for You! Congrats!! on Nov. 8, 2018, 10:22 p.m.
on Nov. 16, 2018, 1:02 a.m.
on Nov. 19, 2018, 3:09 p.m.
on Nov. 21, 2018, 5:18 p.m.
Congratulations Olessya, I have been waiting for this moment and I am looking forward to discovering your work. on Nov. 29, 2018, 7:39 p.m.
on Nov. 30, 2018, 8 a.m.
Ive been working Olessya for 2 years and had the privilege of reading the first draft of this book - I totally fell in love found some amazing style and shopping hints that have changed my look forever. A perfect Christmas gift for women and girls of all ages. Looking forward to the book!! on Nov. 30, 2018, 5:52 p.m. Very much looking forward to read it!!! Thank you for sharing! on Dec. 1, 2018, 11:26 p.m.
Lots of love, hugs and good luck with everything you do!! Well done!!! on Dec. 2, 2018, 11:39 p.m.
on Dec. 4, 2018, 10:28 p.m.
Congrats for your book release! I am so happy to see you shine and passionate about what you do! Looking forward to read your book! on Dec. 4, 2018, 10:46 p.m.
good luck with the book Olessya! on Dec. 5, 2018, 11:47 a.m.
Больших вам успехов Олеся , во всех ваших начинаниях! on Dec. 5, 2018, 2:20 p.m.
on Dec. 5, 2018, 3:23 p.m.